Dealing with a Miscarriage – CounselCare Connection. P.C. I just lost an unborn baby about a month ago. I was about seven weeks or so along. I do know my baby is in Heaven’s arms with Jesus. But it is hard. My husband just packed some clothes tonight and left. My mother has been staying with us for a very long time and we have no privacy and among many other things. He can’t take it no more and he has tried to help her in a nice way to find a place but she won’t take our help. It seems she has become dependant on us. We know she is capable of living on her own. My husband and I got into an argument and he left.I am not stable in a church. I was before the baby, but I started having problems at my church and was treated unfairly. I held no grudges and tried to make things right. My husband wanted to go to church somewhere else and he didn’t want me to go there anymore. He has been out of chruch along time.The Lord showed me God comes first, then my husband and family and then my ministries. So I left the church. There are many rumors about me because I left and it hurts. We have been to a church two times together as a family. My husband likes it and I know God is going to save him. But I am just numb and afraid of being hurt again.My dad betrayed me on the phone. My grandmother is in the hospital with congested heart failure and blod clots, and many other things.I have just had so many things happening all at once. I just can’t take no more. I am so hurting. My family if falling apart. My husband left tonight, My brothers and sister won’t help me with my mom. I need to stand up to her, but it is hard. And I miss my baby. I feel like an unfit mother to my kids because I feel so depressed and not able to be the real me because of my mom being here. I love her and am so guilty because of my feelings. I walk around in guilt.I pray confession all the time because of my thoughts. I know I am rambling now, but I am in such a mess. I know God will help through. But I feel so numb right now. What should I do?Answer: Getting help: First of all, since you are depressed, I would encourage you to get professional counseling by contacting AACC for a referral to a counseling professional in your area. Secondly, I would encourage you to talk with your family physician about taking an antidepressant because you are having trouble focusing since the loss of your baby and seem to be suffering from depression now. Depression is often physiologically based due to a lack of serotonin– a neurochemical which helps give you energy, concentration, etc. Spiritual growth: Thirdly, I would encourage you to try to grow closer to God now. You are walking around with a load of guilt and need to understand fully the forgiveness that you can experience when you put your faith in Christ alone for payment of your sins. Many people are trusting in themselves, their works, going to church, being baptized, etc., to make them right before God and get them into heaven. The wonderful fact is that Jesus Christ has completely paid for the sins of the whole world by His death on the cross and resurrection from the dead. When you trust Him alone as your Savior — for the forgiveness of your sins and for eternal life — you can be assured you are forgiven and are going to heaven. Read more about faith and dealing with guilt on this site. Yes, I agree with you that your baby is in heaven now in the arms of Jesus because Jesus said: “don’t keep the children from me…..for theirs is the kingdom of heaven.” As you get to know Jesus more personally you will find greater assurance that someday you will see this child again. Make it a goal to grow in your relationship with Christ by reading through the gospels in the New Testament. Order Anchor for the Soul or Keep Believing by Ray Pritchard in the Faith section. Dealing with stressful circumstances: You have many overwhelming circumstances to deal with now: your husband leaving, your grandmother’s poor health, your responsibilities in taking care of your Mother..to name a few. But, the hope that you can have is that Jesus can help give you wisdom and supernatural strength to handle these situations. This is a time when you can cry out to Him for help and to intervene. He is close to the broken-hearted. He loves you and wants to help you. 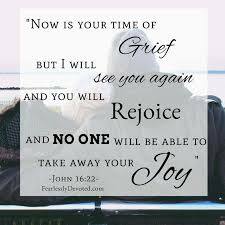 Working through grief: Visit Hannah’s Prayer: a site for those who have lost a child before and after birth and for those who are dealing with infertility. Of course, you need support and you need a solid, Christian church. You need prayer. Find a church in your area from the directory at Willowcreek Community church. Professional counseling and guidance from a pastor will help you walk through this time of turmoil, grief and loss. Give yourself time to grieve the loss of your baby and your husband. Hopefully, your husband will change his mind and return to you and the children. But, you need to go on. Help yourself and help your children as well. Journal your feelings, pray and read the Bible. You will find hope in reading scriptures especially the New Testament and the Psalms. You needn’t despair because Jesus said in Matt. 28:20 “I will never leave you or forsake you.” You can trust Him and know that He can bring good out of these trials and help you to “become strong in the broken places”. When you find a church ask for help financially if you need it. Many churches have a benevolence fund to help people who are in crisis. God bless you! Please let me know how you are doing. Christ is more than a system, tradition, or belief. He claimed to be God. His miracles proved His deity. Josh McDowell writes, “Among the religious leaders who have attained a large following throughout history, Jesus Christ is unique in the fact that He alone claimed to be God in human flesh. A common misconception is that some or many of the leaders of the world’s religions made similar claims, but this is simply not the case. Budda did not claim to be God; Moses never said that he was Yahweh; Muhammad did not identify himself as Allah… Jesus said that he who has seen Him (Jesus) has seen the Father (John 14:9). …Anyone who would dare to make such claims… to forgive sins, to raise Himself from the dead, etc…would have to be either out of his mind or a liar, unless he was (in fact) God.” (from: Answers to Tough Questions Skeptics Ask about the Christian Faith by Josh McDowell and Don Stewart). *Read Response to a Skeptic of Christianity. Jesus is also a Person who knows our needs, feels our pain, and sympathizes with our weaknesses. He understands your loss and your pain. He desires to comfort you and bring hope into your life. He offers to forgive our sins, and to give us the free gift of eternal life…making peace between us and His Father when we decide to trust Him as Lord and Savior of our lives. He loved us so much that He died for our sins 2,000 years ago. Let us know that you have prayed this prayer by contacting us and you will receive this book free: An Anchor for the Soul: Help for the Present, Hope for the Future by Pastor Ray Pritchard.